Welcome summer by joining us for our Summer Solstice Yoga Mala event with live music. What is a Yoga Mala? A Yoga Mala is a yoga tradition of completing 108 sun salutations in alignment with the changing seasons. A sun salutation is the linking of 12 physical poses connected together with breath. 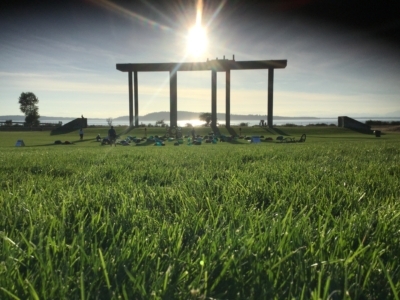 Set your summer intentions with yoga and meditation outdoors under the backdrop of the Puget Sound, neighboring islands and Olympic Mountains. Some yoga experience suggested, but modifications will be shown.